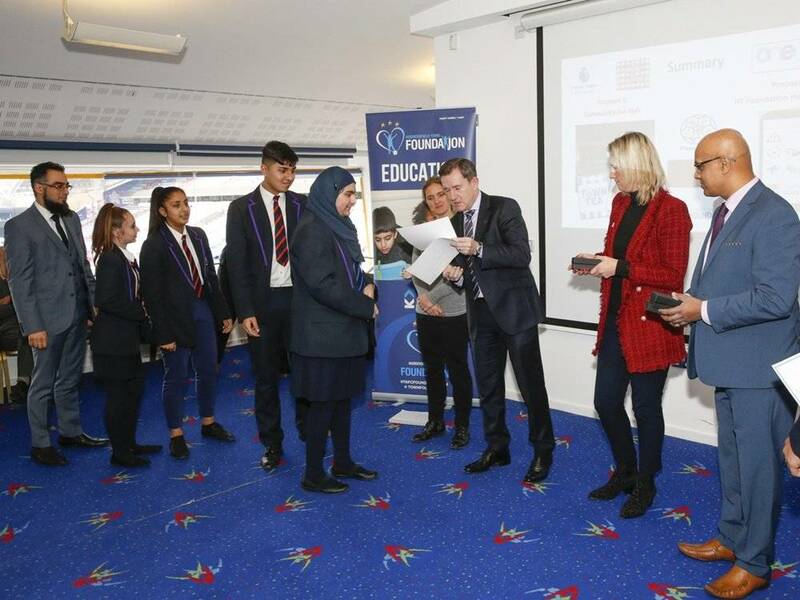 Westborough High School has progressed to the Play-Offs of the Premier League’s Enterprise Challenge after pitching their ideas on making the John Smith’s Stadium more inclusive to a panel which included Huddersfield Town Chairman Dean Hoyle. Year 8, 9 and 10 students from both Shelley College and Westborough High School researched Huddersfield Town, the Club’s fanbase and the local community before coming up with ideas on how to make the John Smith’s Stadium more inclusive to increase the Terriers’ fanbase. Students from both schools pitched their ideas to the panel which included Chairman Dean Hoyle, Club Partner Louise Woollard, Kim Leadbeater (More in Common) and Vas Patel (One Kirklees). Not only this but the Mayor of Kirklees and her consort were in attendance alongside trustees Janet Hoyle, Caroline Lee and Stuart Bragan. The Foundation ran workshops for the students to brainstorm and research their proposals. Students looked at the finances behind their ideas and then put together presentations for the panel. All ideas had to be in line with the Premier League Equality Standard. The five Westborough students – Ahmed Etorki, Nayab Mirza, Usman Qaisar, Hafsa Ahmad, Natasha West – explained how their ideas of a Community Fan Hub and Inclusivity App could help promote inclusion within the John Smith’s Stadium, whilst they also worked out a financial forecast predicting the returns Town could get from incorporating their ideas. Westborough High School will now represent Town in the Play-Offs at Leicester City’s King Power Stadium on Tuesday 16 January 2017, where hopefully we can progress to the National Final in April. Trustees Janet Hoyle and Caroline Lee will join the Foundation team to support the youngsters. If you would like your school involved in next year’s Enterprise Challenge, or would like to know more about the Huddersfield Town Foundations Education Offer, including Premier League Primary Stars please contact katie.suttron@htafcfoundation.com.